The Chandra image of NGC 6240, a butterfly-shaped galaxy that is the product of the collision of two smaller galaxies, revealed that the central region of the galaxy (inset) contains not one, but two active giant black holes. Previous X-ray observatories had shown that the central region was an X-ray source, but astronomers did not know what was producing the X-rays. Radio, infrared, and optical observations had detected two bright nuclei, but their exact nature also remained a mystery. Chandra was able to show that the X-rays were coming from the two nuclei, and determine their X-ray spectra. These cosmic fingerprints revealed features that are characteristic of supermassive black holes - an excess of high-energy photons from gas swirling around a black hole, and X-rays from fluorescing iron atoms in gas near black holes. 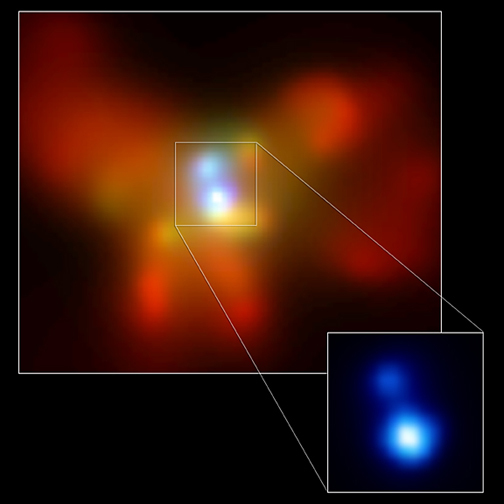 Over the course of the next few hundred million years, the two supermassive black holes, which are about 3000 light years apart, will drift toward one another and merge to form one larger supermassive black hole. 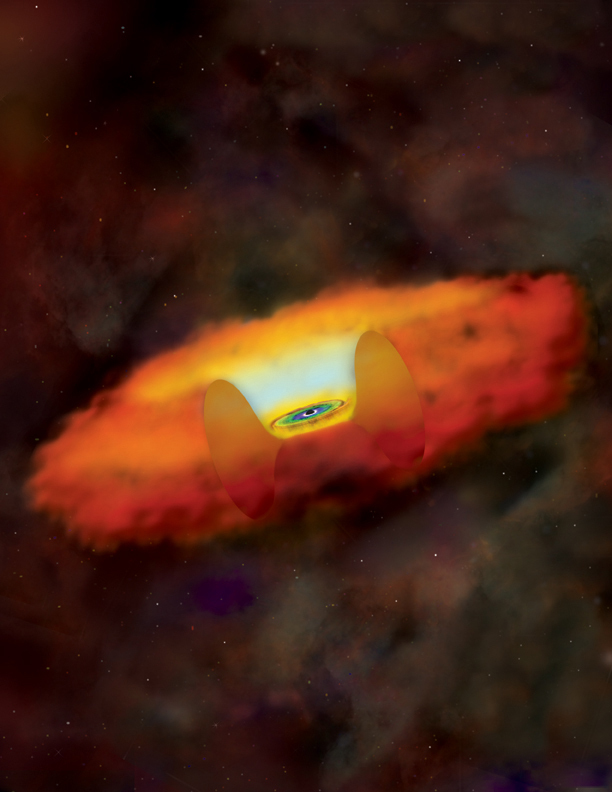 This detection of a binary black hole supports the idea that black holes grow to enormous masses in the centers of galaxies by merging with other black holes. NGC 6240 is a prime example of a "starburst" galaxy in which stars are forming, evolving, and exploding at an exceptionally rapid rate due to a relatively recent merger (30 million years ago). Heat generated by this activity created the extensive multimillion degree Celsius gas seen in this image. Coordinates (J2000) RA 16h 52m 59s | Dec +02° 24´ 1.70"